Explanation: Dusty debris from periodic Comet Swift-Tuttle was swept up by planet Earth this week. Vaporized by their passage through the dense atmosphere at 59 kilometres per second, the tiny grains produced a stream of Perseid meteors. A bright, colourful Perseid meteor flash was captured during this 20 second exposure. 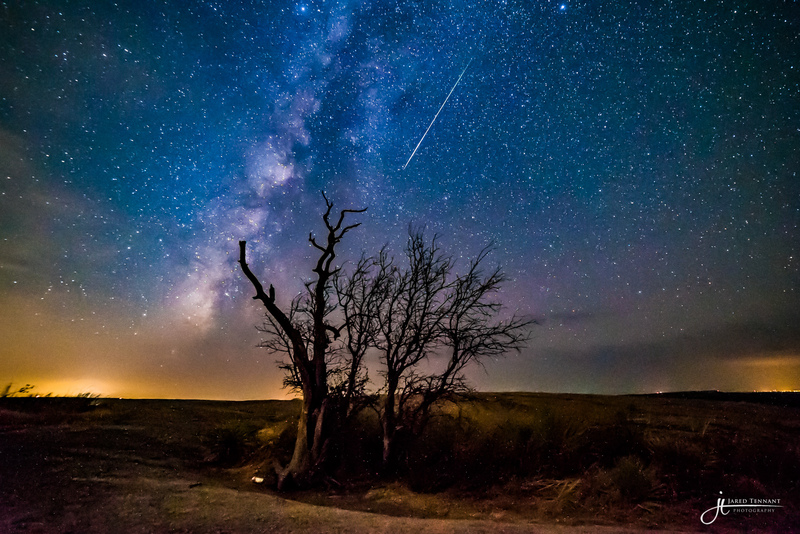 It made its ephemeral appearance after midnight on August 12, in the moonless skies over the broad granite dome of Enchanted Rock State Natural Area, central Texas, USA. Below the Perseid meteor, trees stand in silhouette against scattered lights along the horizon and the faint Milky Way, itself cut by dark clouds of interstellar dust.